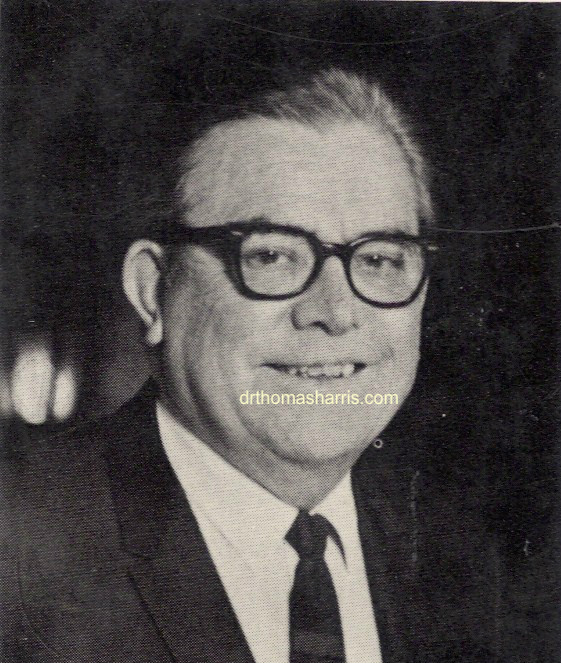 Dr. Thomas Harris in 1968. Clicking on the picture will yield a higher resolution copy. Thomas Anthony Harris was born on April 18, 1910 in Texas. He displayed an interest and proficiency in science and medicine at an early age. Harris attended San Antonio High School and then the University of Texas. He received his Bachelor of Science degree from the University of Arkansas in 1938 and his M.D. degree from Temple University School of Medicine in 1940. Upon graduation from medical school, he immediately began an internship in the Navy. This medicine internship was done prior to any training in Psychiatry. As an intern in the Navy just prior to the U.S. entering World War II, Harris was assigned to areas of possible combat. He was aboard the submarine tender USS Pelias when it was attacked at Pearl Harbor in December 1941. In this attack he sustained ear injuries that produced permanent effects on him for the rest of his life. Upon completion of his internship, he began his training in Psychiatry in 1942 at Saint Elizabeth’s Hospital in Washington DC. Upon completing his psychiatry residency, Harris went back into the Navy, this time as a psychiatrist near the end of World War II. Harris was Chief Psychiatric Officer aboard the hospital ship USS Haven during the direct aftermath of the Battle of Okinawa. Harris was then directed to Nagasaki directly after the dropping of the second atomic bomb to counsel former American POWs. Harris returned stateside after the War and continued in his duties as a Navy Psychiatrist, gradually rising in the ranks and gaining responsibilities. In 1947, he was appointed Chief of the Psychiatric Branch of the Bureau of Medicine and Surgery in the Navy. In addition to clinical work, Harris learned from psychoanalysts in the area, including Dr. Harry Stack Sullivan and Dr. Frieda Fromm-Reichmannn of the Washington-Baltimore Psychoanalytic Institute. Harris’s experience learning from experienced psychoanalysts was similar to that of Dr. Eric Berne who trained with both Paul Federn in NYC and Erik Erikson in San Francisco. Within a couple of years after leaving the Navy, Harris grew tired of administrative roles in larger institutions and longed for a more intimate work environment. He left the Department of Institutions and opened up a private psychiatry practice in Sacramento in 1956. Around this time, a psychiatrist of similar age Dr. Eric Berne MD was in private practice in both Carmel and San Francisco, CA. Over the past several years, Berne had become increasingly frustrated with the currently accepted techniques in psychiatry and psychoanalysis and was developing his own theories. In 1957, he published a paper introducing his new theory called Transactional Analysis. Transactional Analysis used a 3 ego state model similar to Freud, but focused on interactions between individuals. Harris, along with several other psychiatrists and psychoanalysts, became immediately intrigued with Transactional Analysis and began learning the theories from Dr. Berne. They soon began incorporating the treatment modality into their private practices, including Harris in Sacramento. Harris began close collaboration with Berne in 1960. In 1964, Berne published the bestseller Games People Play where games and transactional analysis were introduced to the public. Harris continued working with Berne and other transactional analysts both in incorporating the techniques into clinical psychiatry as well as helping to spread the theory into other countries. 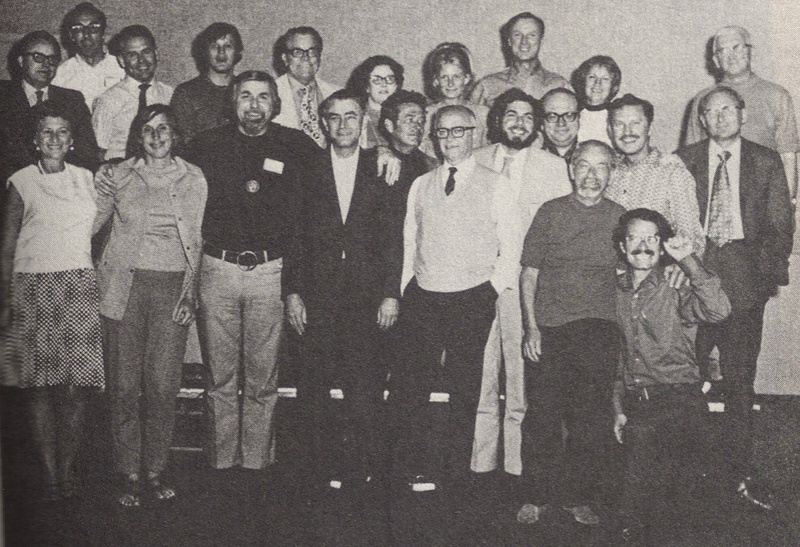 Harris became one of the original members of the San Francisco Social Psychiatry Seminars, a series of lecture organized by Dr. Eric Berne on Transactional Analysis. Dr. Thomas A. Harris at a Transactional Analysis Conference 1966. He is in the back row, the fifth person from the left. The young woman, seventh from the left in the back row, is Eric Berne’s only blood daughter, Ellen Berne. Clicking on the picture will yield a high resolution copy. With the runaway success of Berne’s Games People Play and the spread of Transactional Analysis to Europe and Asia, Harris wanted to make his own contributions. Despite the fact that Games appealed to a wide audience, there was still technical jargon and other language that made it difficult for some to read. Harris set out to write a more practical guide to TA that would appeal to a larger audience. Harris began by using the principles of Transactional Analysis to develop his theory of four life positions. The most common position, according to Harris, is “I’m Not OK – You’re OK.” Inspired by the catchy title Games People Play, Harris devised I’m OK – You’re OK as the title for his book. I’m OK – You’re OK was released in 1969. Some other sources cite this as 1967 as that is the date of the first copyright. But it was released in 1969. See this page for more details on 1967 vs. 1969. It’s catchy title made it an overnight success, with many readers of Berne’s Games People Play going on to purchase I’m OK – You’re OK.
Dr. Eric Berne passed away in June 1970, leaving Harris and the global Transactional Analysis community devastated. But the principles and theories of TA were strongly established globally. As the 1970s progressed, some within the TA community felt Harris had done a “disservice” to Transactional Analysis by publishing what they felt was a “watered-down” version of the principles. Harris remained involved in the TA community, but he was never considered a leader like others since the death of Eric Berne. 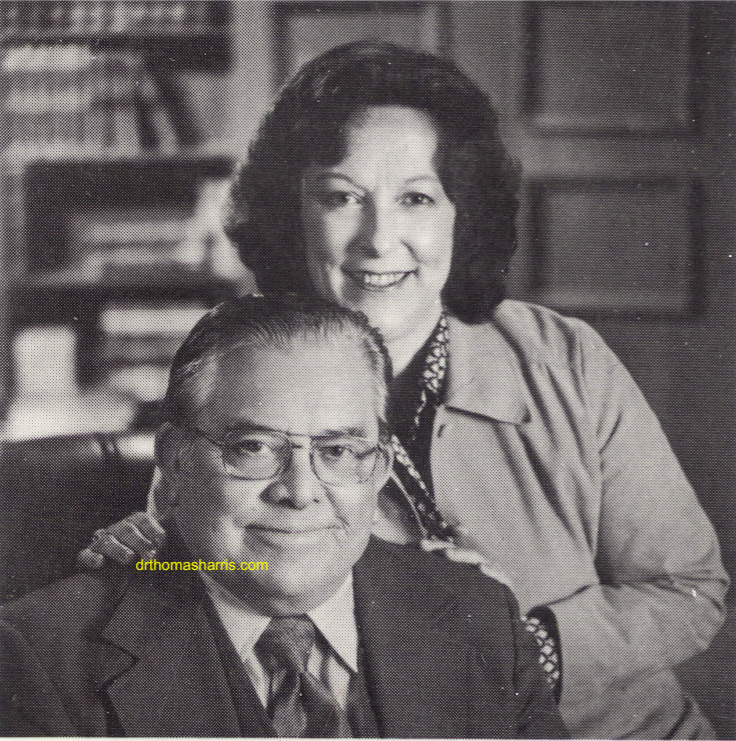 Harris continued in his private practice in Sacramento treating patients but began to slow down his pace over the years. By the time he began work on his next book, he had retired from clinical practice. In 1985, Harris and his wife published a “sequel” to I’m OK – You’re OK called Staying OK. Harris continued his theme of making Transactional Analysis simple and avoided overly technical vocabulary and analogies. The book sold reasonably well but did not achieve any of the widespread success or attention than did its predecessor. He passed away in 1995, leaving behind his wife Amy and his four children. A link to the New York Times Obituary is located here.